We’d all love to stumble upon some financial windfall, but for most of us, it’s just not going to happen. If you want a pot of gold at retirement, you’ll have to fill it yourself ahead of time - bit by bit, day by day. Knowing how and where to tuck it away is the challenge. Fortunately, Lake Michigan Investment Services has financial experts to help you navigate the endless investment opportunities out there. Do you have a couple of old 401(K)s from former employers? Do you have CDs maturing soon? 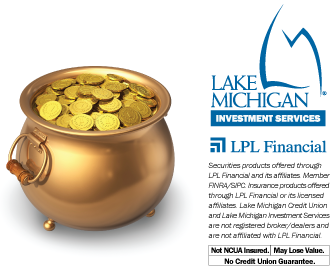 Contact a Lake Michigan Investment Services advisor today for a free investment evaluation. Call us at (616 or 800) 242-9790 ext. 6301 or go online at lmcu.org/investments.